A vampire piggybacking on a king’s back while spinning stories and riddles! Poor King Vikram! Tasked by the sorcerer Shaitanish to bring him a corpse, he finds that a vampire named Betal has taken residence in it. He’ll come along only if King Vikram lends a willing ear to a series of riddling tales. There’s the one about the world’s most sensitive ladies: Queens Touchmenot, Itsratherhot and Oohmyhead. There’s the tale of the four foolish brothers Nin, Com, Poo and Oops. Each tale is crazier, funnier, madder than the last, and even if King Vikram doesn’t enjoy the journey – you sure will! The story of Vikram and Betal is over a thousand years old. This much-loved traditional tale is here brought to life for today’s young readers, accompanied by Priya Kuriyan’s fabulous illustrations. Are you ready for vexing wickedness? Click play to watch the book trailer. 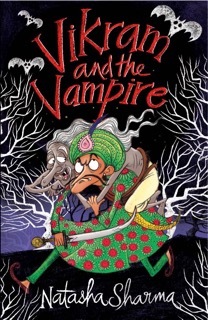 Vikram and the Vampire will be available in stores November 2015. Extremely important sing-along from the book. Chant Flee Flit Fly Flum! “With a brilliant sense of humor Natasha Sharma spins fantastic tales in Vikram and the Vampire. I consider Natasha Sharma to be one of the best contemporary children’s authors in India. She has sharp wit, a deft hand, and the ability to convert old stories into completely fresh new ones.